Microsoft pitched Skype Translator as an enhancement of its video chat service that translates both sides of a conversation. In May, the Redmond, Wash. company pledged that it would preview the service this year. 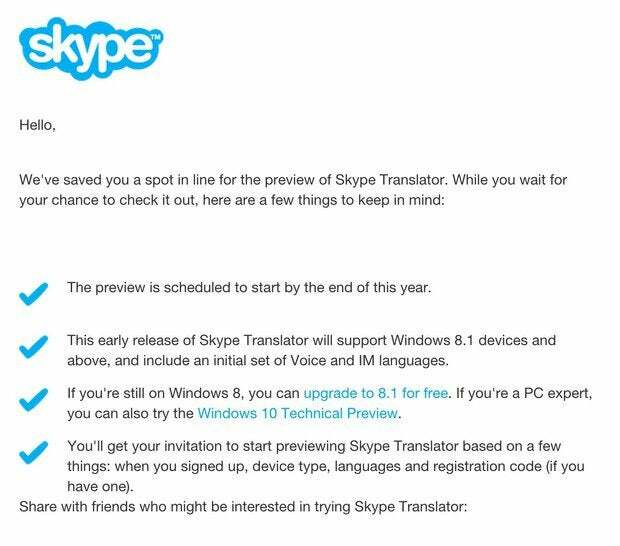 "Skype Translator ... [is] still learning and improving the way it translates calls," Microsoft said on its website Monday. "As such, it'll have a few rough edges, but the more conversations it translates, the better it'll get." Users must register at the website to be considered for the "limited number of preview spots available." Although Microsoft said that the beta would be available only to people running Windows 8.1 or the Windows 10 preview -- and that it would launch at some point before year's end -- it omitted other details, such as how many would be allowed to test the service and which languages would be supported. In the questionnaire Microsoft asked potential previewers to fill out and submit, it listed 11 languages, including Arabic, Chinese, English, German, Japanese and Spanish. Microsoft auto-generates an email reply when someone registers for the Skype Translator preview, but doesn't say whether the submission will be approved, or when.